Guaranteed to prevent roaches, ants, and silverfish 90 days. Homes larger than 2000 sq. ft. $.05 per sq. ft.
German/Kitchen roaches minimum $175.00 includes first follow up service 7-14 days after first service. Exterior portion of treatment includes foundation perimeter, landscaped areas next to home, trim lines, around doors and windows, and accessible eaves. Spiders can be added to the warranty for an additional $50.00, includes a lawn treatment. Mosquito lawn treatments can be done with the general service for $50.00 or less, but are not guaranteed. Mosquito lawn treatments can be done with the general service for $50.00 or less, but are not guaranteed. Ask about out discounts for quarterly services (four times per year) and monthly lawn services. There is no guaranty on Lawn, Rodent, or Flea services. Call for prices on larger properties. Homes larger than 2000 sq. ft. $.06 per sq. ft. There is no guaranty on flea services. Mice can be eliminated as part of our initial service for no additional fee. Installing EXCLUDER in holes we can reach from the ground. Up to 4 interior trap stations. Follow up service calls to remove dead rodents, reset traps, and or replace bait minimum $75.00 per service call within 90 days. Texas official wood destroying insect reports start at $100.00 and are priced the same as our General Initial Pest Service. 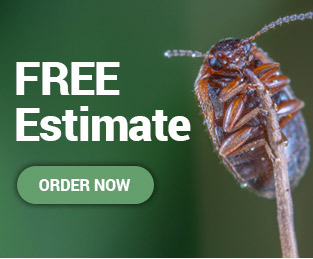 All termite treatments are guaranteed 5 years no annual fees. $75.00 charge for inspection/estimates are deducted from the treatment price when we perform the service. Bed Bug treatments start at $220.00 for homes up to 2000 sq. ft. Larger homes $.10 per sq. ft. Follow up treatments are $100.00 within 30 days. Tick treatments start at $250.00 call for details. Call for prices on Bees, Wasps, and other pests.